After months of sifting through used ads I finally found a KLR that I decided to pony up the money for. It’s a 2001 and has 15,000 miles. Numerous aftermarket mods that I was planning on doing myself already. Ironically, the bike has Alaska plates. Looks like I’ll be taking her back home! I am super excited. Getting a new bike is pretty much better than Christmas for me. A new ride to get used to, new offroad adventures and skills to learn. I was getting kinda bored with my Ninja actually. It will feel good to feel like a noob again. Awesome! I’ve been following your site for a while. I too am planning a South America expedition leaving later this year. I picked up an 01 KLR last year and she’s ready to roll. Best of luck. I look forward to following your progress. Amusing and informative videos on bike maintenance by some experiences motorcycle adventurers. Great, you found one! I bet you’re slightly surprized at how good that type of bike is on corners ! And the sitting position is so good. Why do so many of get stuck on sports /tour type things? Look forward to you personalizing it for your trip. Great bike! youll have a ball! I’m jealous. I was checking out KLRs on the net only last night. Did you have your KLR lowered? I think we’re about the same height (5-9ish), but when I tried sitting on one, I could barely get my leg over, let alone get both feet down solid. In any case, it looks like you’ve found a pretty cool enduro. Actually I’m kinda envious that we don’t get them here in Germany. I don’t think it would be exactly my peace of cake but I’d sure like to try one out some day! 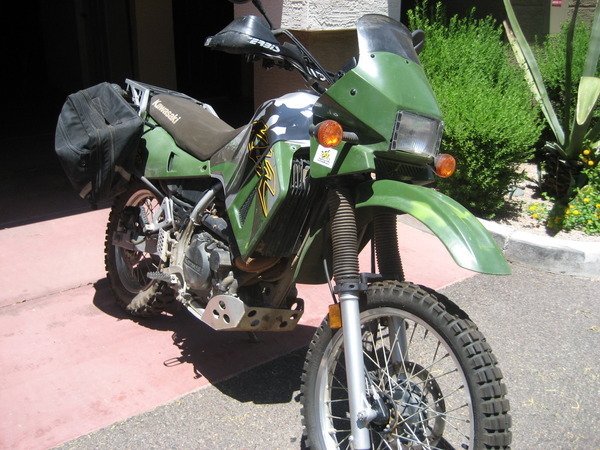 I know this post is old, but it is funny because I had almost the same exact experience when I purchased my KLR for the same exact trip. It was a 2001, green, with 13k miles, and tons of mods I wanted to do. Got me all the way to Ushuaia, though with a couple hiccups along the way, to be expected.